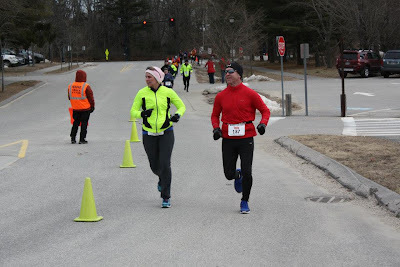 Sunday morning was the Cape Elizabeth Midwinter Classic 10 mile race. Ward and I drove down to race together that morning. It was chilly and I didn't know what to wear for a top - and that stressed me out. I had lots of options but couldn't make up my mind - so I brought them all with me - and then talked about over analyzed the weather with Ward the entire way to Cape Elizabeth. Poor guy. Since I drove to Maine Running Company to pick up the bib #s - I thought I'd treat myself to this fun skull cap. Dorky picture - but I do LOVE my new hat! Izzy apparently does too since she's eyeing it up in the backseat. 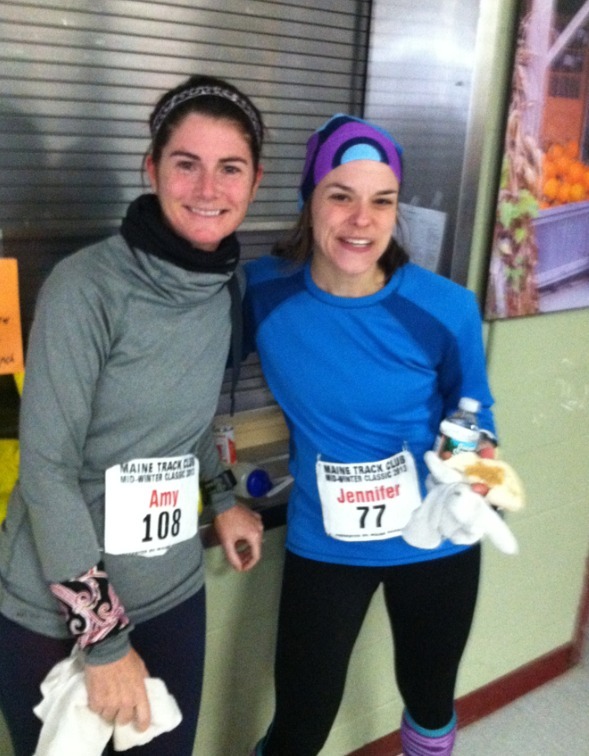 And I had my lucky bib # - 77 - my birth year. Sure to be good luck for me!!! At least I was all set there! When I saw the girls, I talked it over with them (because I'm obsessed) and I came to the conclusion that two shirts was the way to go. Okay. Then I realized I left my RooSport in Ward's car! The worst part is that he was out on a warm up run and I couldn't find his keys in his bag. Ugh. So I may have panicked a little. In the midst of my panic - I finally got to meet my blogging friend, Jen, in real life. She was so sweet. I promise the next time I meet her - I won't be in panic mode. In the craziness in the parking lot, I also saw Michelle. I love that I saw my blogging friends when I was having a meltdown. Then I needed to get my bag of clothes to Stacy's car because Ward had to work right after the race and I was going to drive back with the girls. Because it's been a cruddy, muddy winter season, Stacy's stickers were covered with mud and I didn't recognize her car immediately. What I loser friend I am. When I finally found her car - I had to pee. Again. The race was starting any minute and I wasn't about to sprint to the school to pee inside, so Stacy blocked me (on 1 side) with her car door. But she also took a picture of me after the deed was done. Caught! The best part was only a few moment later some guy came running along the fence. I wonder if he saw my bare bum? The girls and I headed over to the starting line - wished each other luck and then went to our spots where we felt comfortable. Ward came out of no where and decided that he was going to keep warm by hugging me - which was all good with me. I was warm too. Normally he doesn't hang out with me at the start of a race, so I liked this little change. Jen was a little jealous she didn't have a cuddle buddy though. Soon enough the race started and Ward ditched me in no time. I got my music going and started to just go with it. I remembered the start of the race being easier, so I decided that I was going to take advantage of the downhills and cruise through them. Ward always tells me the downhills are free, so I tried to take that advice and just opened up as I flew down them. 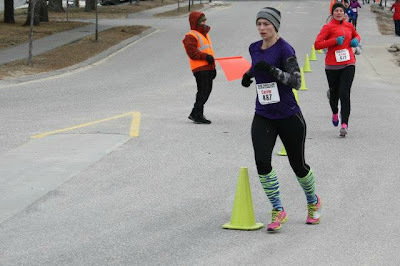 My first five miles were pretty rocking - 7:17, 7:58, 7:47, 7:46, 8:01. I ate some honey stingers around mile 5, not because I needed to, but because I thought I should. The hills were starting to come and then the wind hit and I started to lose my momentum. Then around mile 7 Andy cruised by me. I was so jealous he passed me, but he definitely deserved a better time because I knew he was working much harder on hills than I have recently. I did keep him in my sights for the rest of the race. 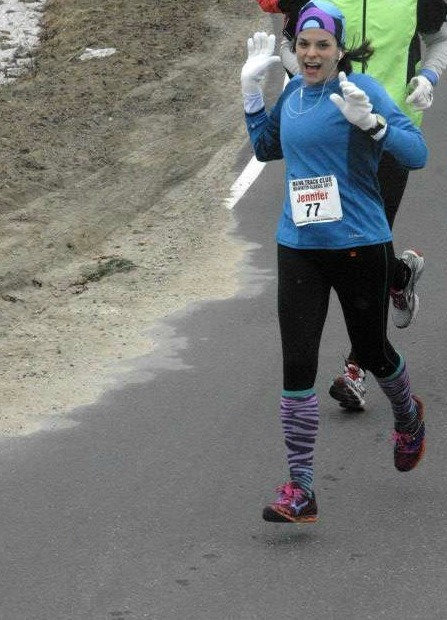 About 1.5 miles left of the race, I saw Danielle and Sarah standing on the side of the road - cheering me on. 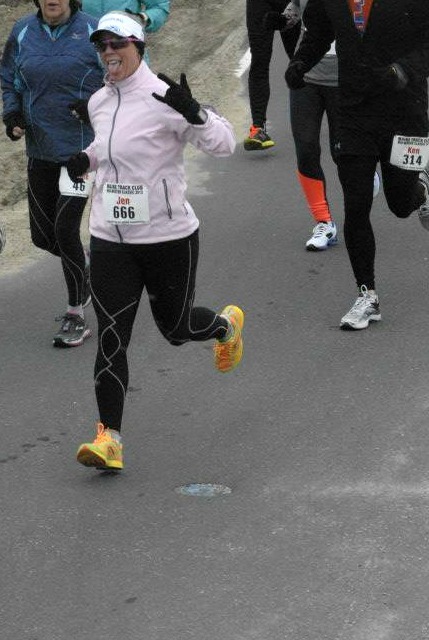 Their cheering definitely helped me get through the next 1/2 mile or so until I saw Ward coming back for me. I can always rely on him to come back and save me when I need it. When I saw him I was hurting. I wanted to stop. I was exhausted. But he said all of the right things and got me to get over the hill. I actually turned off my iPod this time (normally I don't) so I could hear him because this time I really wanted to hear what he was saying. He helped me get my breathing back under control and helped with arms. As we entered the school parking lot, he got me to the last curve and then told me to give it everything I had left, and so I did. Miles 6-10: 8:12, 8:07, 8:11, 8:09, 7:58. Not horrible, but I know I lost steam and probably went out too fast in the beginning. Considering the hills and the fact I've been doing a bulk of my runs on the treadmill - I still call these miles a huge success. My finishing time was 1:19:47. Last year's time was 1:24 and change and I just wanted to beat that and was secretly hoping for 1:20:00. Goal met! Ward came back and paced me to the end. Love that man. After I crossed the finish line, I congratulated Andy on a great race. Then I found Ward, got his keys so he could head off to work, and then I hung out around the finish line to cheer everyone else on. I got to see DM friend, Jim again. He is just so darn nice. Then I saw Sarah and Danielle. Danielle has got to one of the cutest pregnant ladies I've ever seen. Well, Sarah was a pretty cute pregnant lady too. When all the girls finished the race, we headed inside for some much needed food and water. By then we were all pretty cold. We spotted Amy and her husband over on the side - so I stopped over to see her for a few moments and we got our picture taken. Thank goodness she had her phone with her because mine was in Stacy's car still. I introduced her to Mizuno-guy, Seth. And then we headed home. I didn't realize until later on that Ward actually won his age group. If I had known, I would have stayed for the awards and gotten his prize for him. Fortunately, he'll be able to pick up his award later this week. Of course we had to have a group picture of us before leaving the race. We are all absolutely freezing right here and could not wait to get the heat pumping in the car and some warm clothes on! 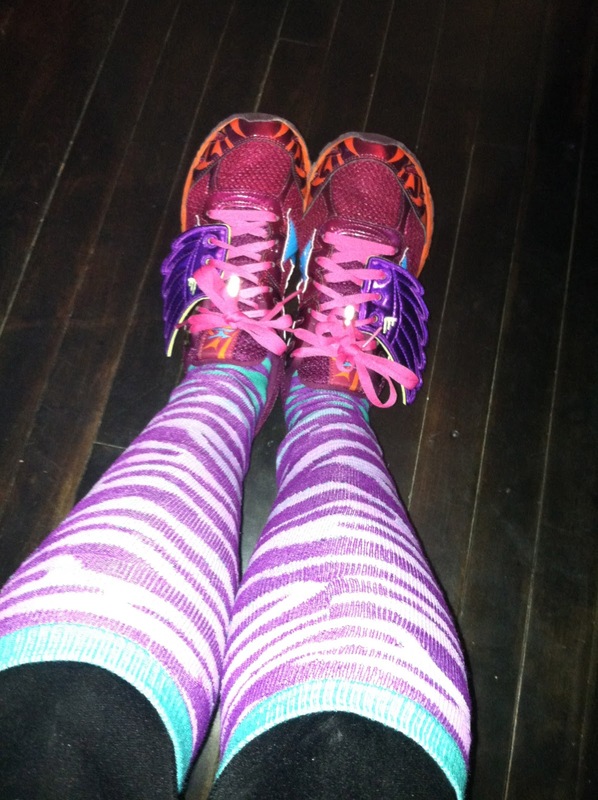 Mizuno + Schwings = Race Day Fun! In all the craziness of meeting new friends, hanging with current friends, and making new friends, somehow I missed seeing my pal, Sara. 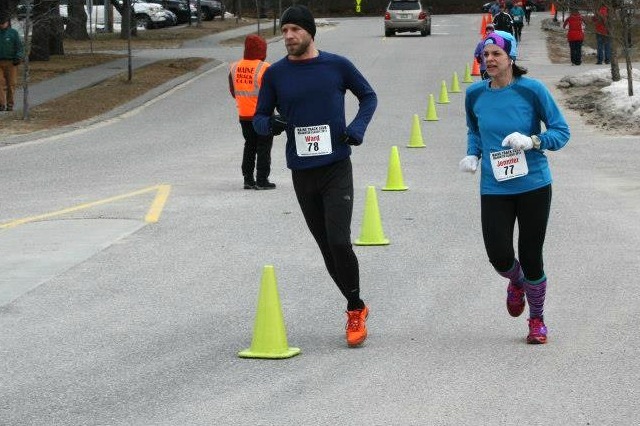 She and her man decided that it would be a great idea to do 10 miles before the 10 mile race. Now that is dedication - sticking with the plan. 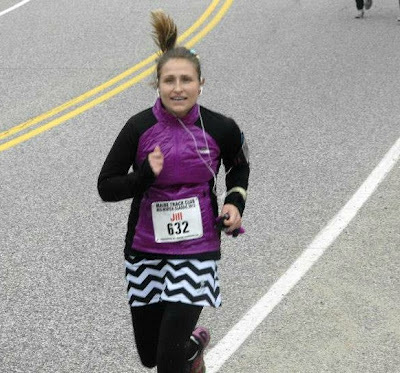 I just cannot wait until the weather is warmer and I can race in a skirt and tank top again. Until then, I'll just have to keep layering up and wearing my cool new hat! Nice job Jen! You continue to inspire me with every run you do! Wow! What a fantastic race, you did amazing! I love your outfit, the swings, the socks , the skull cap (Izzy is the cutest!) and you got to meet Amy! It sounds like a really fun day. I wish we were closer... would love to meet you and run together someday...#BucketList A huge Congratulations on a nice PR! Great job! Looks cold lol Cute hat! Adorable hat! Congratulations on the race! You are so freakin fast it isn't even funny! (or fair...) lol well, you DO work pretty hard for it. Great job! That time and those splits were smokin'! You killed it girl! Awesome run!! Congratulations! Great recap! It was definitely a fun weekend! P.S. I love my new boots. They just fit over my massive calves. LOL. That Ward is a keeper! Congrats on his win. How fun to see so many friends and take fun pics. 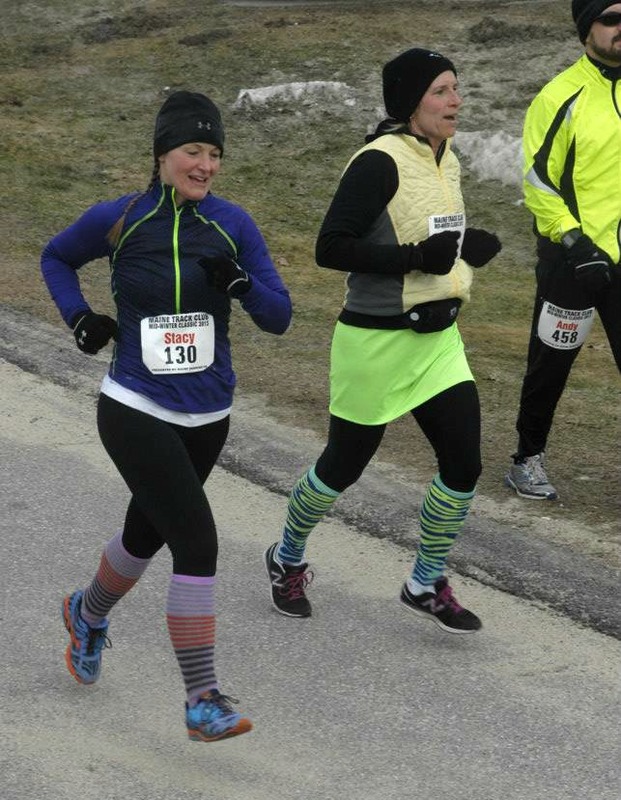 Nice job- it was so cold and windy for those last few miles! I love your hat and socks and don't understand why they aren't MINE! I think I need to meet this Mizuno guy of yours, considering that I blow thru a pair every other damn month it would be good to have a "guy.."
You did awesome!!! I love Izzy's face behind you in that pic! Wow, five minutes off- that's fantastic! 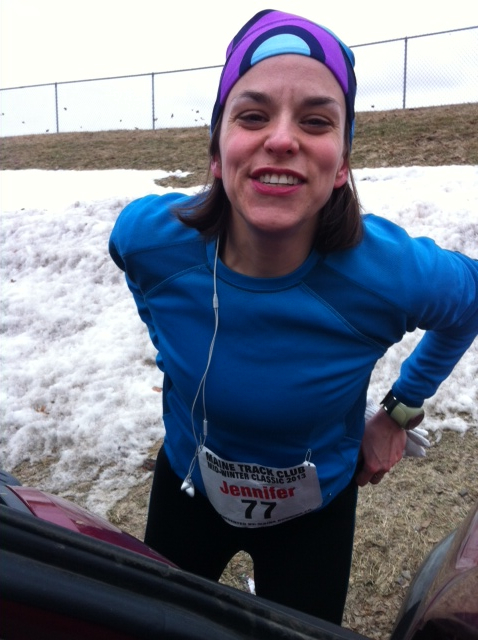 Congrats on an awesome race, especially with the wind and hills. So fun that there were so many familiar faces there, too! We recently moved to Maine- I'll have to put this on my race schedule for next year! Congrats on a great race! Congratulations on the new PR!! You did amazing!